Snacks and Beverages of Choice: Tea, tea, tea, and probably some toast. What are your goals for the Readathon? My tentative plan is to spend the entire day reading The House of Seven Gables by Nathaniel Hawthorne. It's been on my shelves a long time, and it's longish, and I wonder if I can finish it today. Also, it's a nice gothic-ish type of thing to read by the fire on a cold day. I treasure the very few cold days we get here on the Gulf Coast. Are you excited? To be honest, right now my main emotion is worry that I won't really be able to just read all day--it's Saturday, a pretty busy day around here. But my ever-understanding husband has graciously agreed to handle all the kids' needs to be taken places today, so that I can undertake this geeky enterprise, lol. 2:15 pm CST: I'm 75 pages into The House of the Seven Gables and enjoying it very much. I probably won't finish it today, but will likely get a considerable part of it done. Having lunch now. 9:00 pm CST: 200 pages in now, out of 312--I may finish this thing tonight! And it's a great read. 12:20 am CST: Finished The House of the Seven Gables! Starting The Nortorious Jumping Frog of Calveras County and Other Stories by Mark Twain. I pulled this off my shelf because it's so short, lol. Maybe I can finish it, too, although I'm pretty tired now. What book(s) did you read during the event? I read The House of the Seven Gables by Nathaniel Hawthorne, in its entirety. What did you like about our event? I loved giving the day over to reading--I never do that. And I loved being able to check a book off my massive TBR list. 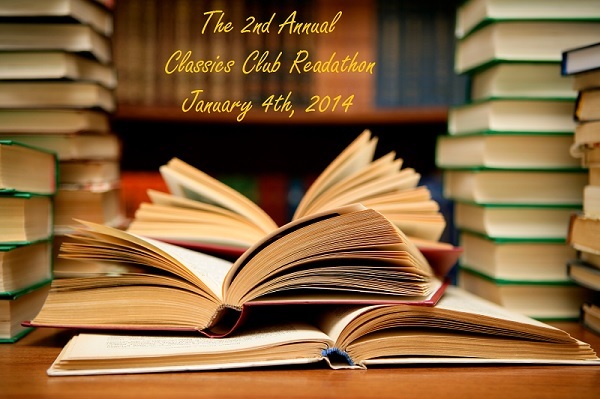 Do you have suggestions for future Readathons through The Classics Club? Nope. Would you participate in future Readathons? Yes, schedule permitting. Discerning that Clifford was not gladdened by her efforts, Hepzibah searched about the house for the means of more exhilarating pastime. At one time, her eyes chanced to rest on Alice Pyncheon's harpsichord. It was a moment of great peril; for--despite the traditionary awe that had gathered over this instrument of music, and the dirges which spiritual fingers were said to play on it--the devoted sister had solemn thoughts of thrumming on its chords for Clifford's benefit, and accompanying the performance with her voice. Poor Clifford! Poor Hepzibah! Poor Harpsichord! All three would have been miserable together. Thanks Adam and Classics Club for hosting this fun event!